Are you tired of buying expensive drapes and blinds just to protect your privacy? Do you have beautiful windows that you really don't even want to cover up? We all need privacy in our homes, offices, RV's...but drapes and blinds are expensive and not easy to install. In fact, some windows are architecturally beautiful, and you really don't want to cover them at all. 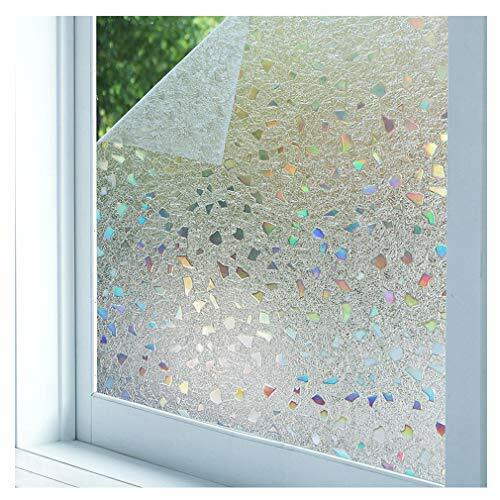 Bloss's window film has solved this problem, our self adhesive privacy window film are very easy to apply, virtually mess-free and there's no adhesive, so it's removable! This window film works on window glass, door panels and even glass shower doors. Light can pass through, so no dark areas are created, and you have instant privacy! For windows there's the added benefit that this vinyl film blocks heat glare and harmful UV rays. Your decorative privacy film is not affected by moisture and steam from temperature changes or showers...no peeling, no bubbling...just a beautiful window decal for many years. Your window treatment and privacy problems have just been solved! ☀️ No adhesive, removable without any residue; Static cling, easy to apply and can be applied several times.Water is the only tool you will use,more water,more better. Create a beautiful rainbow when sunshine past through. If you have any questions about this product by Bloss, contact us by completing and submitting the form below. If you are looking for a specif part number, please include it with your message.